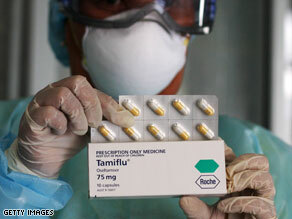 LONDON, England (CNN) -- The number of Internet scammers offering fake anti-swine flu drug Tamiflu has surpassed those selling counterfeit Viagra, a UK body said Friday. Since the H1N1 virus, also known as swine flu, was declared a global pandemic last month, there has been an increase in the number of Web sites and junk emails offering Tamiflu for sale. More than 70,000 people have now been infected with the virus, according to the World Health Organization. The increase in the number of cases has, in turn, led to a surge in the number of cyber criminals seeking to cash in on the pandemic. David Pruce, Director of Policy for the UK's Royal Pharmaceutical Society (RPS) told CNN: "From looking at sites that used to sell Viagra and the amount of spam emails we're having reported to us, we think that Tamiflu is now the most spammed drug on the Internet. "Since the outbreak, every Web site that used to sell Viagra is now selling Tamiflu. We are pretty sure that the same people are making the Tamiflu as are making the Viagra." The RPS research suggests more than two million people regularly buy medicine over the Internet. However, the majority of those are from registered online pharmacies. Pruce cautioned against buying Tamiflu over the Internet, saying, "we know that half the Viagra on the Internet is fake and half the Tamiflu that's around will probably be fake as well. "The fake drugs could have anything from sugar to another drug that's similar, or often it's a lower dose of the drug, or even rat poison." His views were echoed by the UK government's chief medical officer who warned the public against panic-buying anti-swine flu drugs online. Liam Donaldson said in an interview with breakfast program GMTV that Britain had a massive stockpile of Tamiflu and would be one of the first countries to have access to a vaccine, with the first supplies arriving at the end of next month. The warning comes as it emerged Friday that a 19-year-old man has become the first person to die in London after contracting swine flu. The teenager, who was suffering from other undisclosed serious health problems, tested positive for the virus following his death on Wednesday, according to a statement from the country's National Health Service. He is the fourth person in the UK to die from the virus. Britain's Health Secretary Andy Burnham Thursday issued a warning in the House of Commons that 40 Britons a day could die from the illness. He also said the government's emergency response had moved from containing the swine flu outbreak into the "treatment phase." The change in the government's swine flu strategy came as the World Health Organization warned that the spread of swine flu was now "unstoppable," with a total of 112 countries reporting nearly 77,201 infected people and 332 deaths since April. Dr Margaret Chan, the WHO director general, told an international conference on swine flu in Mexico: "With well over 100 countries reporting cases, once a fully fit pandemic virus emerges its further international spread is unstoppable." She added that while most deaths had so far occurred in people with serious underlying medical conditions, there were a few exceptions that caused concern. "For reasons that are poorly understood, some deaths are occurring in perfectly healthy young people," she said.